Happy Easter, if that's the kind of thing that makes you happy. If not, you're in need of some laughs. I've got just the tonic for you. Or Colleen Brow does, anyway. She'll be in while I OD on chocolate with her own What's So Funny? : CCC edition. That'd be Colleen's Comedy Clips. I have no idea who she's lined up but I'm sure you'll get some laughs. Tune in to Co-op radio, CFRO 100.5 FM, in Vancouver from 11 pm to midnight. I know I will (if I'm not in a chocolate coma). You can livestream it at coopradio.org or on your TuneIn Radio app or whatever you use to access the world's radio stations. 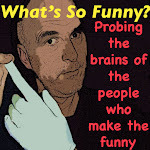 Oh, by the way, while you're at coopradio.org, check out the feature article on the homepage about What's So Funny? Available now wherever websites are accessible. Facebook tells me it's the first day of spring, although I always thought it was the 21st. But close enough. In fact, the internet confirms that Facebook is right; it's the earliest spring since 1896. Who knew it could do whatever it wanted whenever it wanted? 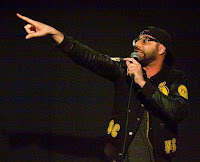 So let's celebrate the vernal equinox with Toronto-based standup comic Dave Merheje. Dave's only been with us once before, back in 2013. The Windsor native is a multi-award winner. He's been in town for a week or so and is leaving tomorrow so we're lucky to have him in studio tonight. We're on the air at 11 pm on CFRO 100.5 FM in Vancouver. If there are any problems there, try livestreaming us at coopradio.org or find us on your TuneIn Radio app. Whew. All caught up on the podcast drops. This one is a good one, as one would expect with Ari Shaffir. The host of Skeptic Tank does more than podcasts in his basement. He also performs standup comedy in front of actual human beings on stages all over the world. Someone alert Howard Stern! In this episode, the always opinionated and engaging Shaffir talks about his old pal Carlos Mencia, plausible deniability on a kibbutz, the pernicious effects of adverbs in journalism, his fascination with pedophiles, Jehovah, the positive aspects of offence, practice making perfect, censorship, and his beefs with the aforementioned Howard Stern. This episode brought to you bleep-free! Get started on it by clicking on the player below, if you can see it. If you can't, or want to order this episode to go, head on over to iTunes, Stitcher, or places like that. You know what to do, so do it. Let's hit the road for the latest podcast installment. It's been a while since we've used the roving What's So Funny? studio. This one wasn't planned. Standup comic Mike Storck flew from his home in Baltimore to Seattle and would be driving up to headline Lafflines in New Westminster. The plan was to meet him in his hotel room and record an episode. But it took longer than he expected. When he finally got there, just 15 minutes before I'd have to leave, I got a brainstorm. Fire up the roving studio! I'd drive him into town and we'd talk along the way. Perfect. We did just that. Buckle up for safety. Here we go. Click on the gizmo below to start the ignition. Or go download us at iTunes or Stitcher or wherever you choose. Almost caught up on the podcasts. Exciting, right? Here's the Sara Bynoe episode. Ms Bynoe is all over the Vancouver comedy scene like a dirty shirt. (Never quite understood that expression, but there you go.) She created, hosts and performs a ton of unique shows. I think we spend the first 20 minutes just going over all of them. We also talk about tap dancing, Puppy Bowl, partying clean, trying standup, partying with esteemed author Kliph Nesteroff, and being creeped out by Jian Ghomeshi long before his creepiness made front page news. Have a listen, won't you? You can click on the gizmo below (if you see it on your browser) or go find us at iTunes or Stitcher or wherever fine podcasts are downloadable.